BUDAPEST, May 1, 2015 - Special Representative for China-CEECs Cooperations Huo Yuzhen(2nd L), Hungary's Minister of Foreign Affairs and Trade Peter Szijjarto(3rd L) and Chinese Ambassador to Hungary Xiao Qian(4th L) attend the welcoming ceremony of Air China's first flight at Budapest Ferenc Liszt International Airport in Budapest, Hungary on May 1, 2015. 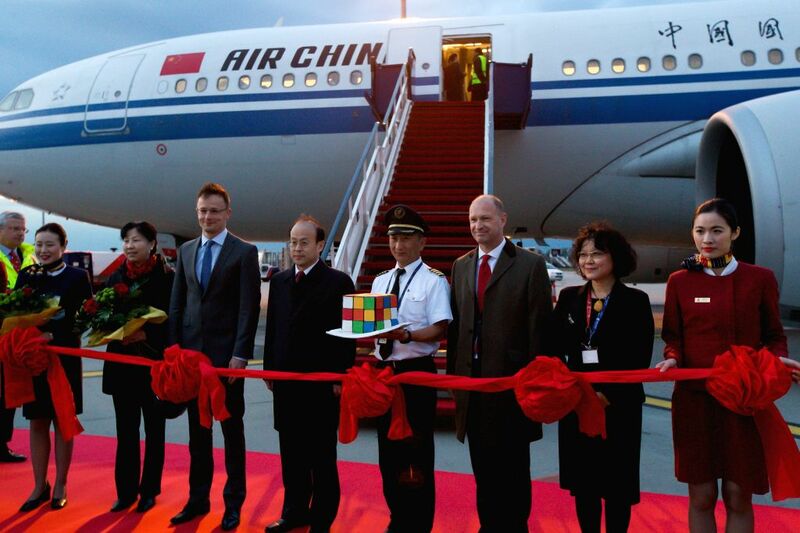 Air China's Beijing-Budapest route was officially inaugurated on Friday evening, when its Airbus 330-200 landed at Budapest Ferenc Liszt International Airport. On the way to Budapest the flight stops once, in Minsk, Belarus, but the return trip from Budapest to Beijing is non-stop.